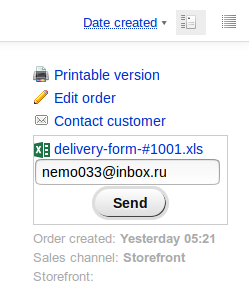 This plugin is useful for those who need an order form. The plugin has flexible settings. In particular, you can configure translation of all fields in the form to any language. The plugin is able to display data about the order in the usual prices, purchase prices and crossed out prices. In some fields, you can adjust the font size to, for example, the text of the company name did not go beyond the cell. The plugin can send the generated file to an arbitrary mailbox. You can configure the plug-in so that by default, the file is sent to the mail box of the buyer.